Grab a single Granny Smith apple for this luscious Apple Cinnamon Cake Recipe. Our Apple Cinnamon Cake Recipe has a crumb layer for autumn appeal. Line 2 (9-inch) round pans with parchment; spray with cooking spray. Microwave butter, 1/2 cup sugar and 1/2 tsp. cinnamon in microwaveable bowl on HIGH 2 min. ; stir until blended. Pour into prepared pans; spread to evenly cover bottoms. Top with apples. Reserve 1 Tbsp. nuts; sprinkle remaining nuts over apples. Beat cake mix, dry pudding mix, water, oil, eggs and 1 tsp. of the remaining cinnamon with mixer until blended; pour over nuts in pans. Bake 28 min. or until toothpick inserted in centers comes out clean. Cool cakes in pans 10 min. Loosen cakes from sides of pans with knife; invert onto wire racks. Gently remove pans and parchment. Cool cakes completely. Beat cream cheese, milk, remaining sugar and cinnamon in medium bowl with mixer until light and fluffy. Gently stir in COOL WHIP. Stack cake layers, crumble sides up, on plate, spreading half the cream cheese mixture between layers. 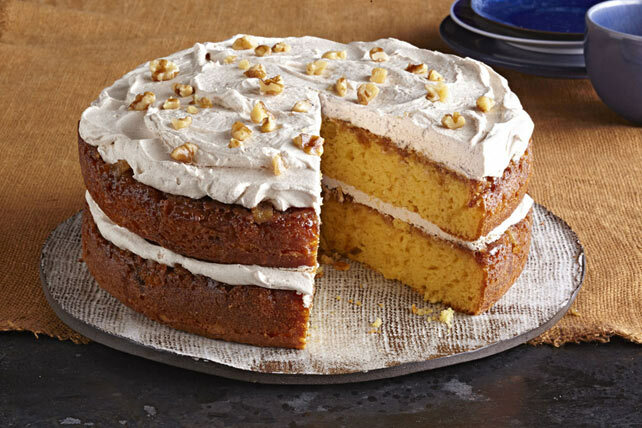 Spread remaining cream cheese mixture onto top of cake; sprinkle with reserved nuts.